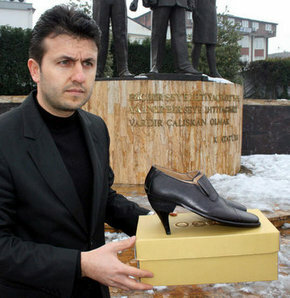 A lawyers' association in Bartin sends Sarkozy a pair of high-heeled shoes to help him address his height complex. Sarkozy, who has opposed Turkish entry into the European Union since taking the French president, is seen by Turks as the main force behind the law. Turkey achieved a key victory in France on Tuesday after suffering two serious diplomatic setbacks in its relations with France. Last month, the French National Assembly voted to make it illegal to deny what France recognized in 2001 as the Armenian genocide and what most Turks now recognize as the massacre of a large number of Armenians (and Turks) in the last days of the Ottoman Empire. Soon after, the French Senate also voted for passage, prompting a harsh response from Turkey and threat of sanctions. Turkey has been wrangling for the past week to pressure French lawmakers to apply to France's Constitutional Council for annulment of the law, and whether due to Turkish pressure or not, 77 French senators and 65 members of the National Assembly, from Sarkozy's own party, have applied for annulment. French president Nicolas Sarkozy is thought to be the mastermind of the new law, and the allegation in Turkey is that the law is pure electioneering on the part of a political leader trying to curry support with France's 500,000 Armenian voters ahead of French elections. Sarkozy cannot sign the legislation into law until the Constitutional Court issues a ruling, which should come within 30 days. Though Turkish politicians' indignant responses to the law's passage were to be expected, for the most part the government and politicians have behaved responsibly. Such resolutions tend to rally Turkish nationalism, and to the government's credit, despite initial talk of sanctions and Prime Minister Erdogan's vowing that he would not again set foot in France should Sarkozy be re-elected, things could have been much worse. For more on this point, see Hurriyet columnist Sedat Ergin. Here, I might also mention Turkish Minister for EU Affairs and Chief Negotiator Egemen Bagis's rather provocative statement in Switzerland, which has already passed a law making it a crime to deny the Armenian genocide. Criticizing the French law as a fundamental violation of the freedom of expression, Bagis went onto point to the Swiss law and then move to flatly deny the genocide while daring Swiss authorities to arrest him -- probably not the most diplomatic move in the world, but it most surely scores points with Turkish voters. For now, the rhetoric is on hold while diplomats from both countries await a ruling. The time will also hopefully allow the Turkish government to calmly prepare for what could ultimately be a disappointing ruling. Important to note here that despite Bagis's outburst and the strong Turkish reaction, many EU politicians have backed Turkey on the issue, including Enlargement Commissioner Stefan Fule who has said that "history should be left for historians." Amnesty International has condemned the French law as an undue restriction on the freedom of expression. For my take on the Armenian question and such moves in foreign capitals in general, click here. For more on Armenians in Turkey, who are almost always caught in the middle of the issue, click here.